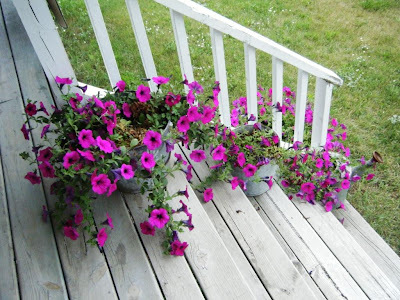 My Wave Petunias have filled out a lot more in their pots. I love the bright, welcoming color that greets me when I pull up in our driveway. Every year I have an inward struggle about the pruning of these plants. I know that if I sacrificed a few blooms and snipped off the long leggy growth, I would have a nice compact mound over each pot. I can't bring myself to do that. I like the wild, wayward "wild-child" growth. I don't want to remove a single bloom before it's exhausted. Can't help it. So, it gives me pleasure the way it is. 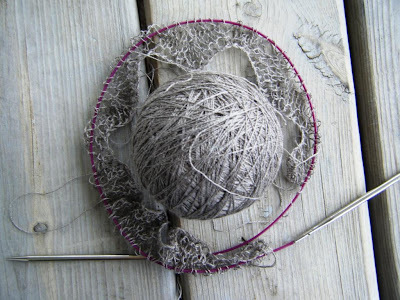 Working on my new Estonian lace shawl, made with a yak and silk cobweb weight blend. This will be a VERY lightweight shawl. 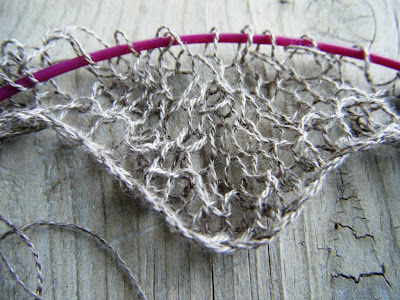 It will be a "wedding-ring" shawl in the sense that it will easily be able to fit through a ring when complete. I like the fussiness. I am excited to see how it turns out. I like the wild-child look as well. And I LOVE your shawl. It's going to be so pretty!